1. 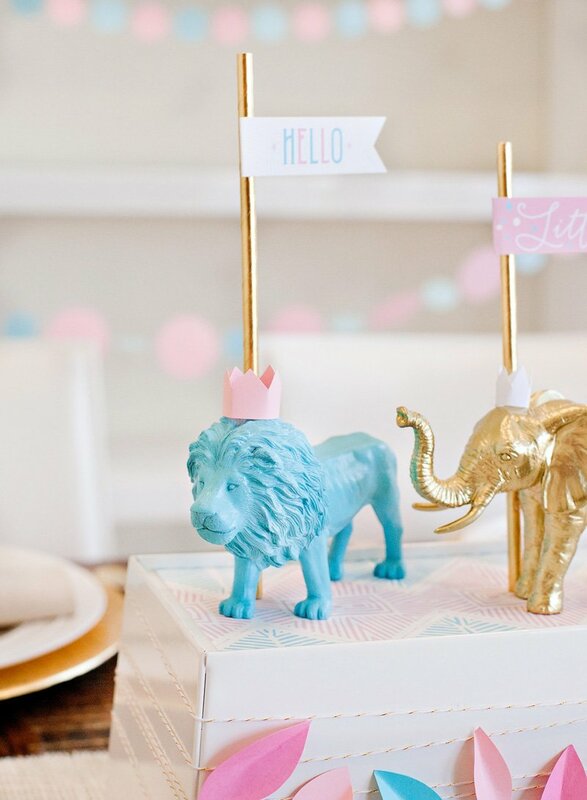 If you’re looking to throw a Royal Baby Shower, you’re in the right place. You’ll find lots of very doable decorating ideas here + you can download all of my printables for free at the bottom of this post, which should make things extra easy for you to recreate at home. My career background is in graphic design, and I always rely on stylish paper elements to both inspire a theme and put the finishing touches on an event. You know, those things that take a project from good to great! 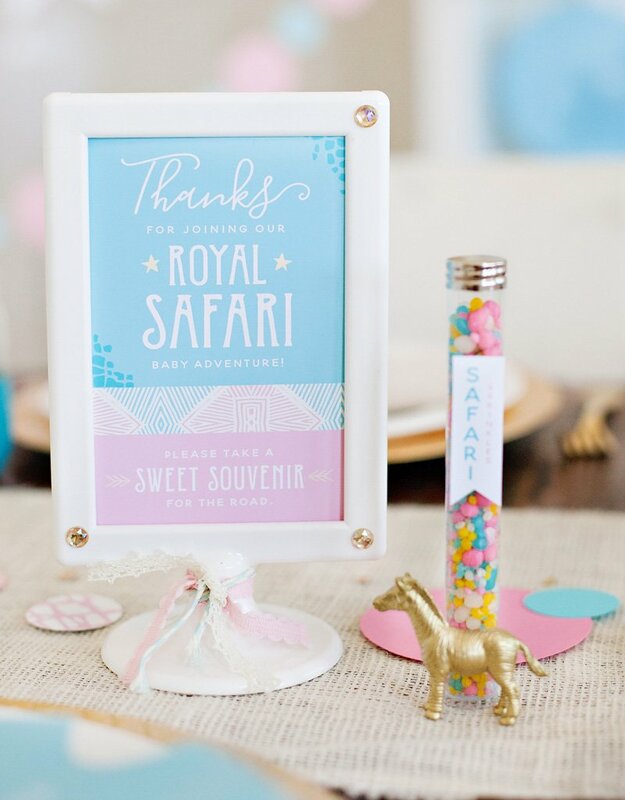 From small details like mini paper flags on straws to big elements like custom banners displaying the guest of honor name(s) across the room, paper is a wonderfully versatile decorative tool and always makes a huge impact on the party space. I truly believe there’s no centerpiece, dessert table, place setting, or party favor that can’t be substantially improved with a cleverly placed paper detail (or two!). 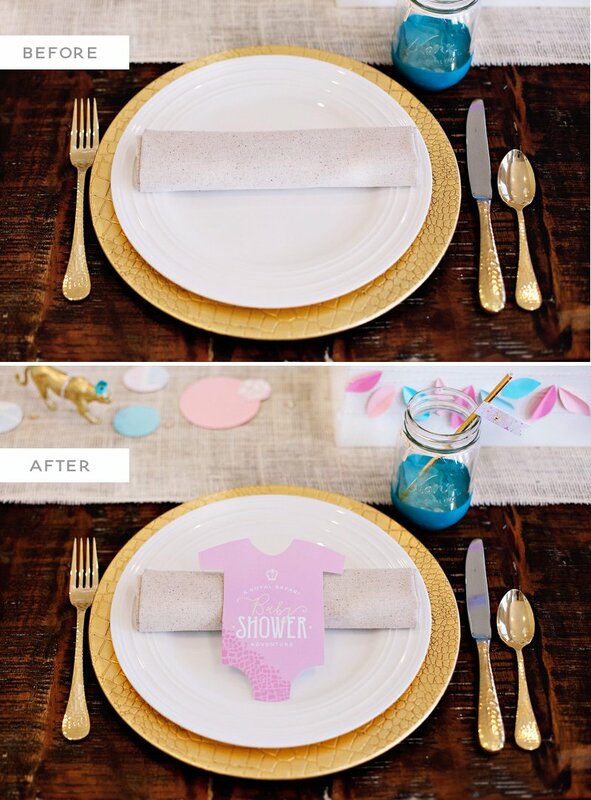 Let’s start by taking a closer look at the place settings. 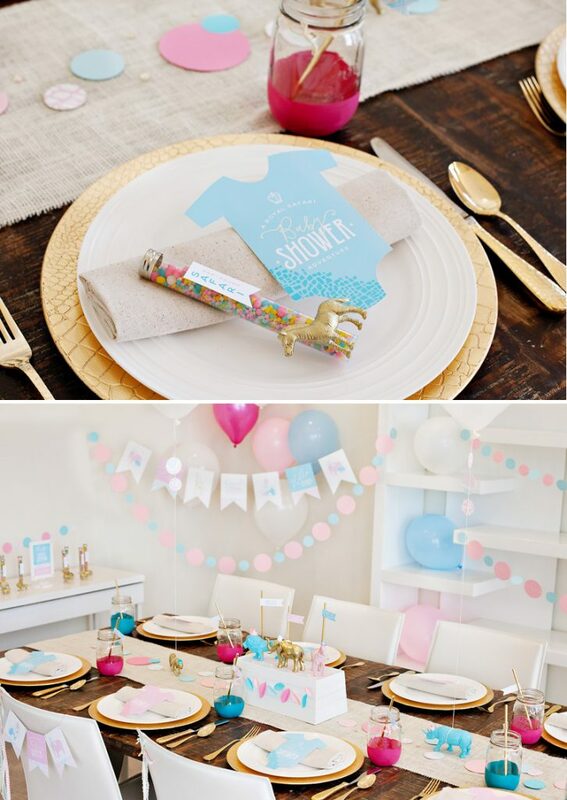 This set-up is very simple and a bit bland on its own, but a colorful paper onesie placed on top of the napkins makes ALL the difference! I have printable onesies for you guys below in both blue and pink so you can create a boy, girl, or gender neutral baby shower with them. 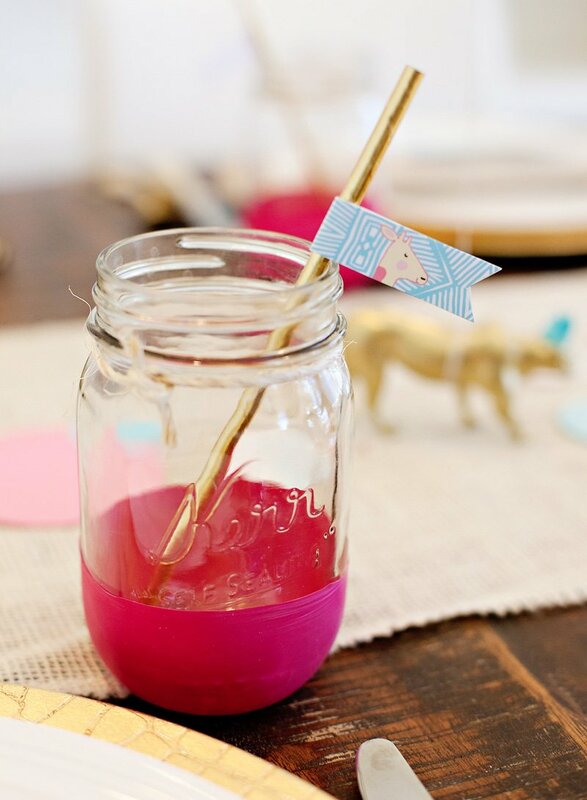 These mason jars are “balloon-dipped” for a nice pop of color, but the gold paper straws with giraffe and lion party flags are what really make them match our party theme. I glued little (freehand cut) paper crowns and party flags to each animal, and cut out leaf shapes from colored card stock to decorate the display stand. 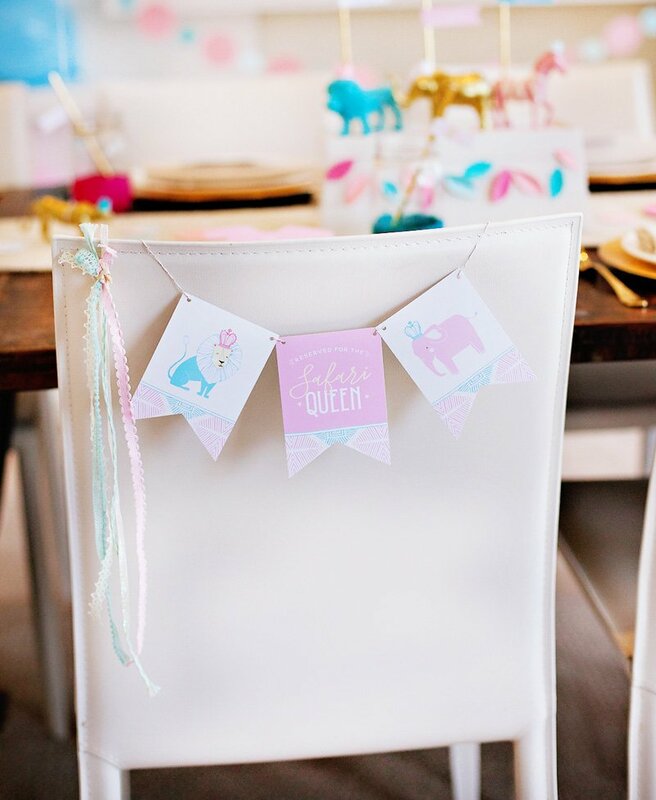 Baby showers are about making mom-to-be feel special, so I like to use small paper banners to help designate her very own “guest of honor chair”. Since this is a Royal Safari celebration, our guest of honor gets to sit in a “Safari Queen” chair this time. ;) A mix of cut ribbons adds a pretty touch to all the chair backs as well. 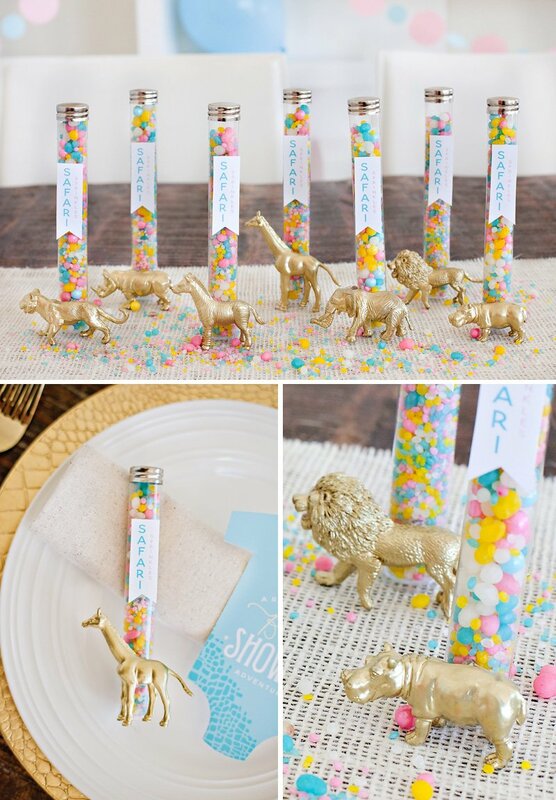 You can add a big splash of color to ANY table with oversize confetti punched from solid and patterned papers. I used circle craft punches ranging from 1.5 to 3” here. 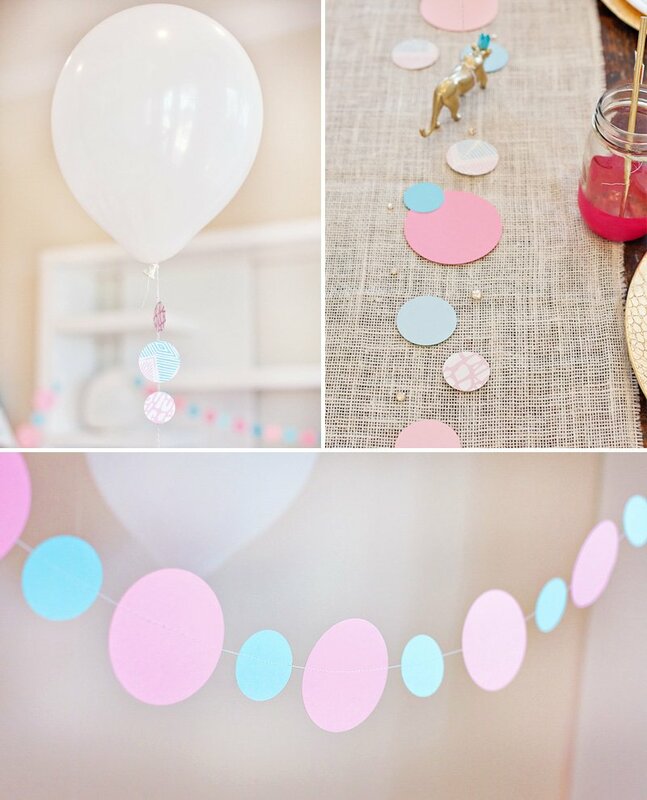 You can also string your paper confetti into mod circle garlands! Sewing the circles together is the fastest way to create a lot of these garlands, but if you don’t know someone that’s handy with a sewing machine, don’t fret… you can always hot glue or tape the circles to your string instead. I used a few paper circles to make “tassels” for some of the balloons too. 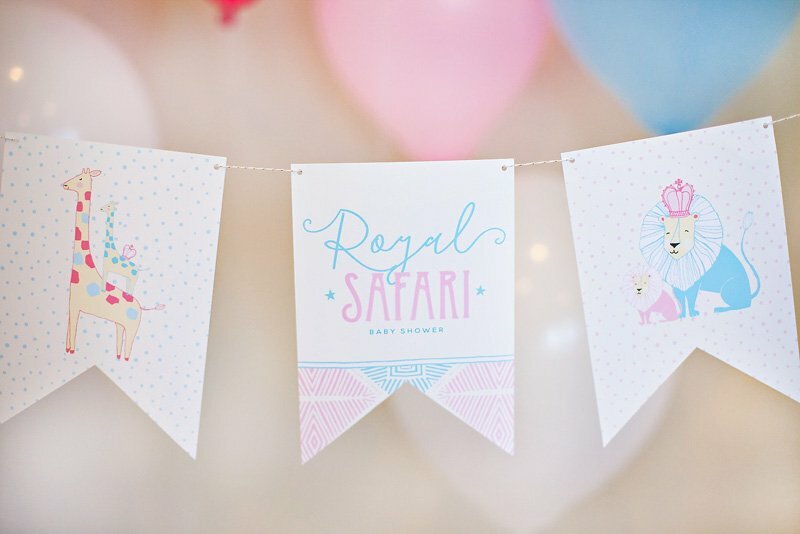 Speaking of balloons… nothing says party like balloons & BANNERS, right?! 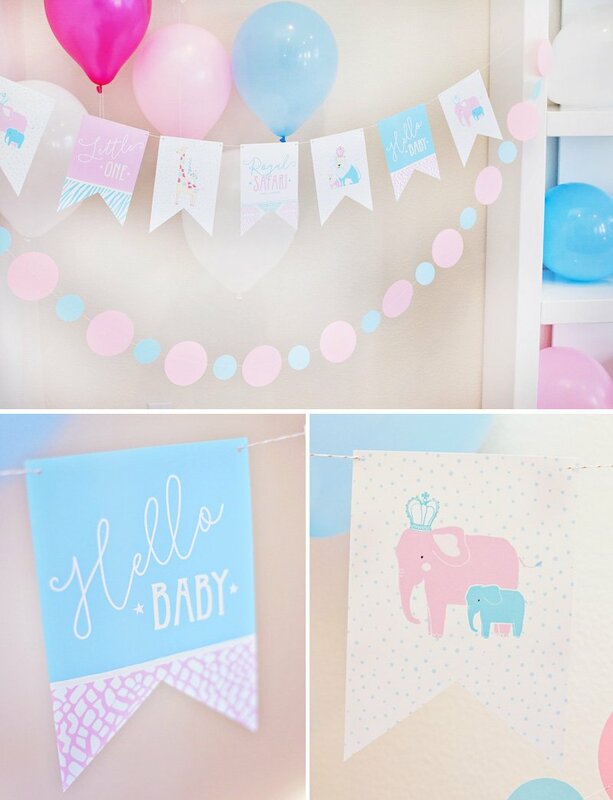 Banners are especially great for personalizing a party and highlighting your theme. Last, but not least, are the party favors! It’s always great to send guests home with a sweet thank you gift that matches your theme AND is something they’ll actually use. For me, that usually means giving them an edible treat with customized packaging. 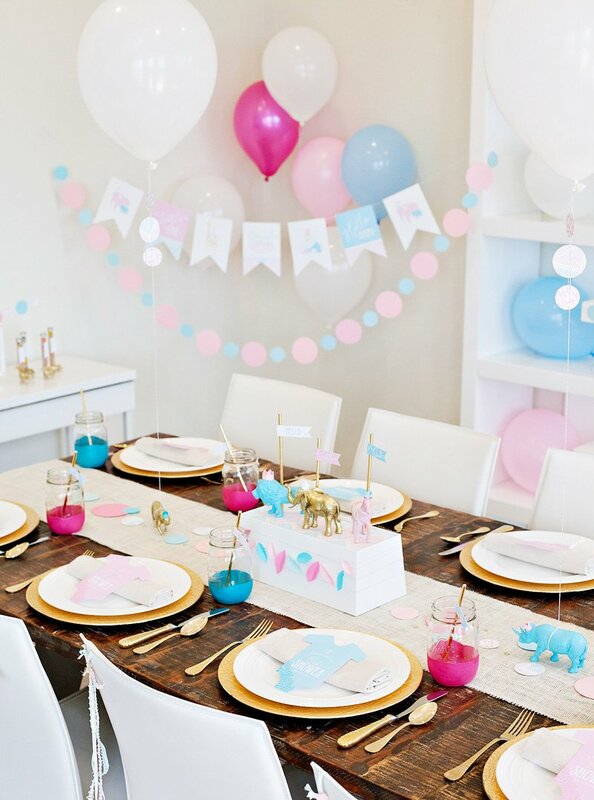 So, to quickly recap, here are all the places that paper helped me bring this baby shower to life: place settings, drinks, centerpiece, table runner (as confetti), balloons (as tassels), walls (as garlands and banners), and party favors! 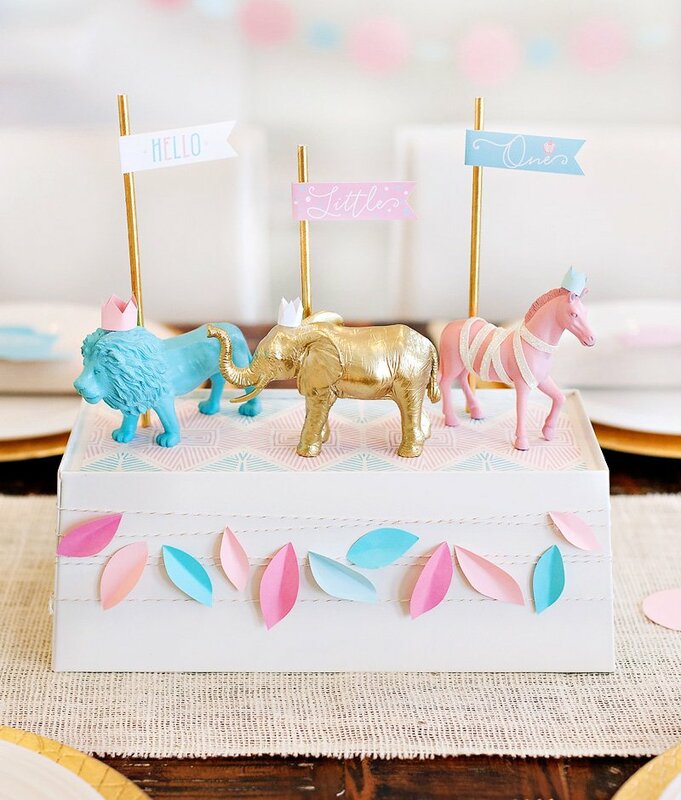 If I had created a matching dessert table, you’d also find paper lining the dessert trays, topping the cake, and labeling all the treats with playful names. 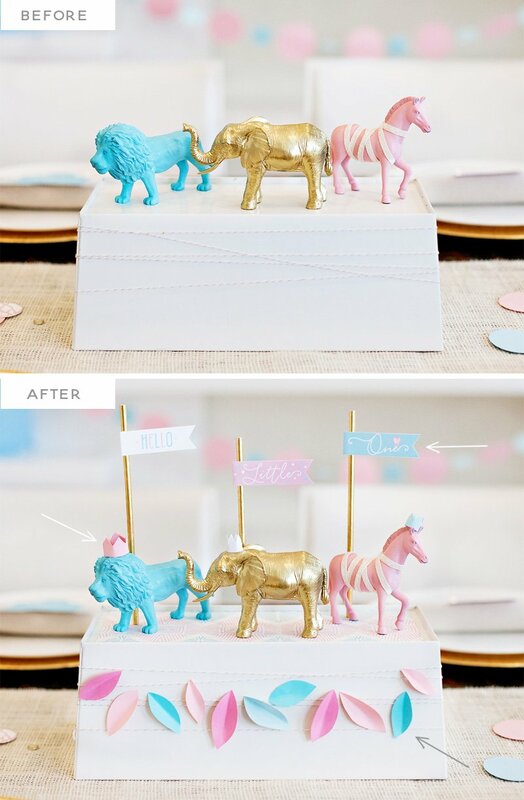 Regardless of what theme you might be planning, though, I hope this post has helped to demonstrate what paper can do for you when it comes to styling and customizing your parties! Scroll down to download the printables, and for lots more examples of the power of paper in action, check out more of my party themes, or visit HowLifeUnfolds.com. Disclosure: This post is sponsored by the Paper & Packaging – How Life Unfolds™ campaign. As always, all thoughts & opinions are my own. Thank you so much for supporting the companies that make it possible for me to keep the creative content coming your way! Thank you for the printables. They are perfect! 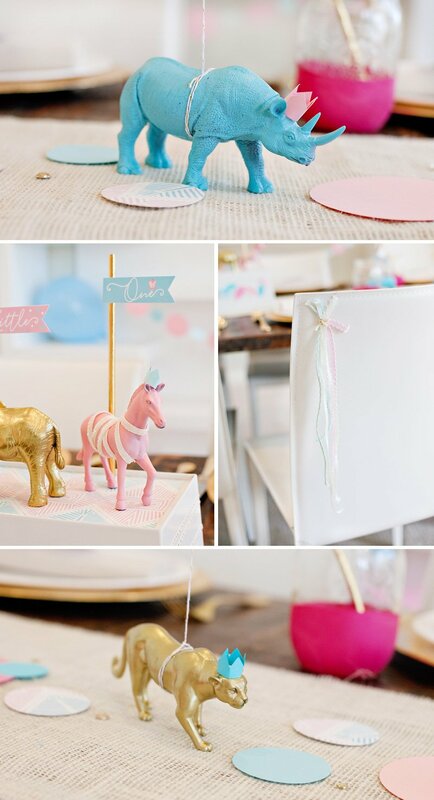 Party hats are always a good idea, but miniature party hats on the plastic animals is an absolutely delightful touch! I’d love to see those paper leaves and string used as a technique to wrap a beautiful present, too.